May 17th is almost here! This day is set aside to say a prayer (or make a wish) for the end of Congenital Diaphragmatic Hernia. CDH is a devastating birth defect that has struck more than half a million babies since 2000. That’s a baby every 6 minutes diagnosed with CDH! 50% of these babies do not survive and the cause is not known. More awareness and research is desperately needed!!!! On May 17th please take a moment to say a prayer (or make a wish) that the cause and prevention of CDH is found. There is power in prayer (and wishes)! And please tell at least 1 person about CDH to educate them about this birth defect. Just 1 person (or more!). Ask your church or other group to include info about CDH in their programs for that day. Attend an event. Wear a CDH ribbon, wear a shirt or other logo item. Hand out buttons. Release balloons. Send info to your family and friends. Post on your blogs and web sites. Post on your Facebook or Myspace account. Get more friends to join this event! March for Babies – May 16 in San Antonio, TX. Join CHERUBS member Karen Myers as she marches in memory of her children Kaleigh and William and raises awareness and funds for the March of Dimes. 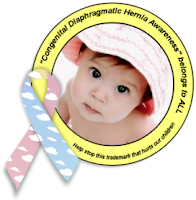 Official Congenital Diaphragmatic Hernia Awareness Ribbon buttons! 100 for $10 – that’s a lot of CDH Awareness! Great project for May 17th – CDH Day of Prayer and Education! 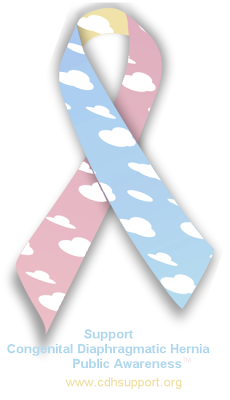 This is the OFFICIAL Congenital Diaphragmatic Hernia Awareness Ribbon as voted on by CDH families themselves. It is not owned by anyone, there are no trademarks or copyrights to it and it is not used by any other cause. It is the CDH Awareness Ribbon recognized by 1000’s of families around the world, Wikipedia and the members of the Alliance of Congenital Diaphragmatic Hernia Organizations, which is a group of dozens of CDH organizations, sites and researchers. CHERUBS does not make any money off of your orders for buttons, not 1 cent! We just want everyone to raise awareness!!! You can order other CDH awareness items at http://www.cafepress.com/cherubs – a small percentage of the purchases at our cafepress store does go to CHERUBS. It’s all about raising CDH Awareness and hoping for an end to this devastating birth defect! Thank you, on behalf of all CDH families! Right now, as I sit here on this beautiful spring day enjoying a sandwich and working, I am so thankful for my blessings. But as I sit here, I know I take for granted that somewhere this moment is devastating to someone. Right now, some one is hearing the words “Congenital Diaphragmatic Hernia” for the first time. And their life will never be the same. Right now, a couple that went into an ultrasound appointment hoping to find out if their baby was a boy or girl now longer cares what gender their baby is. They just want their child to survive. Right now, in a pediatric intensive care unit, somewhere a mom is sitting beside her newborn and trying to barter with God for her baby’s life. Right now, a family is praying that their baby will fight off an infection and make it through the night, pacing the hospital waiting room and waiting for test results. And praying that the antibiotics don’t do more harm than good. Right now, a family sits in the OR waiting room, waiting for news about their child’s CDH repair or chest tube placement or Nissen or G-tube placement. Hoping that their baby will be able to come off the ventilator easily after surgery. Right now, a mom sits at home with child, crying because she is so frustrated that she can’t get her baby to eat by mouth. Again. And worried that the feeding tube she uses to make sure her child gets enough calories will always be there. Right now, a couple tries to decide if it’s wise to take their child to a playground because they are terrified he / she will pick up a virus that could devastate their already fragile lungs. So they sit at home in isolation. Again. Right now, a couple sits in a Ronald McDonald House, waiting for visiting hours to go see their child. And so thankful that they have a place to stay and other families to talk to. But it’s not home and it’s not a situation they ever wanted to be in. Right now, a mom is lovingly taking care of her child’s scar; cleaning and re bandaging it. But it’s not from falling off of a bike or stumbling playing hop-scotch. It’s from a major surgery and it will be scar is that is always there, even after it’s healed. Right now a dad is waiting for x-ray results, hoping against hope that his child hasn’t reherniated. Right now, a family is sitting in a funeral parlor choosing a casket and trying to decide where to bury their baby that they never got to bring home. Every 6 minutes a child is diagnosed with CDH. The time to find the cause and prevention of CDH is right now. Alliance of many CDH Organizations supporting families and research of Congenital Diaphragmatic Hernia. This listserv is for organization founders, presidents and CEO’s to keep each other abreast of research studies, new procedures, and organization problems. By working together as a team we can support each other, and the babies and families, in the fight against CDH. These are the CDH organizations that truly support these babies and work together. We are a large Global CDH community working to increase research, make sure that all families have information and support and protect CDH awareness so that it belongs to all. Each organization in ACDHO is equal, there are no leaders. Organizations / groups / sites invited into ACHO have shown high integrity in helping CDH families, offer research or support for CDH and a clear desire to work with the entire CDH community. Invitations are by a majority vote to secure that ACDHO goals remain positive, that the group works well together and that ACDHO is a safe environment to work together to help CDH families. This listserv / alliance is *not* for individual CDH parents, survivors, etc. Please join the various groups and organizations for CDH information, support, research and awareness that offer services at the member level for CDH families. Please show your support to these groups and organizations who support CDH families! CDH families all over the internet are joining in on the Congenital Diaphragmatic Hernia Blog Webring. A webring connects sites or blogs with a similar interest so that readers can turn from site to site (or blog to blog) throughout the ring. Over 50 CDH blogs are currently in this ring. To flip through the blogs, just click on Next or Previous under the blogs ring logo to the right of our blog.